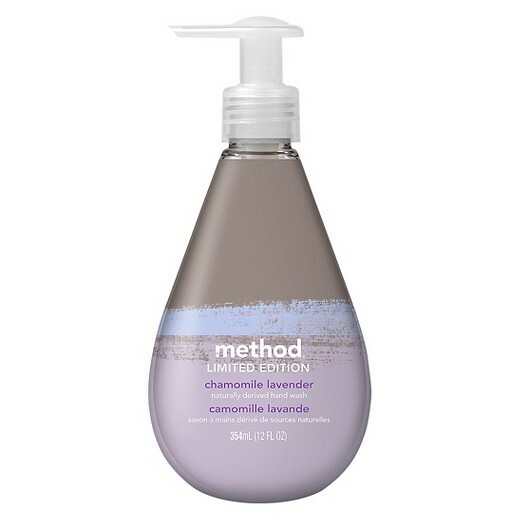 I've been a big fan of Method products for years, and I'm always amazed by the fragrance combinations they create to make home a lovely, clean smelling environment. This spring they've launched a limited edition hand soap line inspired by wellness drinks, tea culture and minimalist decor. The scents are all calming to provide a few minutes of serenity each and every time you wash your hands. Method Limited Edition Gel Hand Soap Ginger Tea (which also comes in a foam version), is based on the feeling you get when you have a warm cup of ginger lemon tea. The fragrance is spot on with equal does of both ginger and lemon, and the gel is concentrated and silky. I love that when I used Method Limited Edition Gel Hand Soap Ginger Tea my hands were completely clean, but not tight or dry when I dried them off. The scent lingered nicely throughout the day, but never became overwhelming. There are two other versions I loved. The Method Limited Edition Gel Hand Soap Chamomile Lavender which is based on Chamomile is your go-to tea when you want to unwind. And lavender a proven herb to help you relax. Method Limited Edition Gel Hand Soap White Rose is perfect for all your rose lovers. The fresh rose scent is balanced with a lighter, airy slightly citrus scent. *The limited edition method line also has foam versions of all the soap fragrances. *These products were provided courtesy of method PR for reviewing purposes.